Icons are all around us—some we admire, others inspire us, and sometimes they come in the form of a sixth-grade teacher. In her student days at the UO, Maryanne Obersinner ’93 didn’t know much about icons—or that the UO’s Jordan Schnitzer Museum of Art, into which she’d sometimes duck to take a peaceful break from her busy schedule, housed an extensive permanent collection of icon artwork and artifacts. Yet, for the past twelve years, icons have played a significant role in her life—and the lives of nearly 600 students that have passed through the O’Hara Catholic School classroom in Eugene where she teaches. Icons are the centerpiece of Obersinner’s Living Saints Project that connects her students with the University, the community, and perhaps the divine. 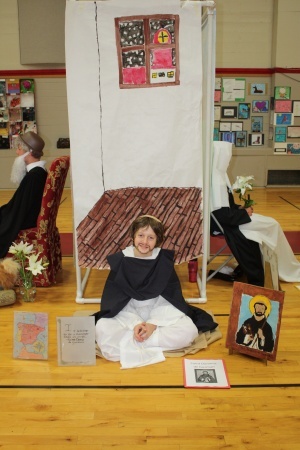 The idea for the project grew out of a workshop she attended in 1998 where another teacher showed photographs of students dressed up as saints. “My mind just started to light up with ideas,” Obersinner says. She saw how the study of a saint could lend itself perfectly to interdisciplinary learning. Integrating social studies, visual arts, history, religion, and geography, students could learn about the context in which their saint lived—from the culture and politics of the period to the artwork and textiles. And with nearly 10,000 saints (and “blesseds”—those beatified by the Catholic Church) from which to choose, the possible areas of study are nearly endless, circling the globe and extending far back in history. Students in her sixth-grade class each select a Catholic saint and, for the next three months, immerse themselves in that saint’s world. 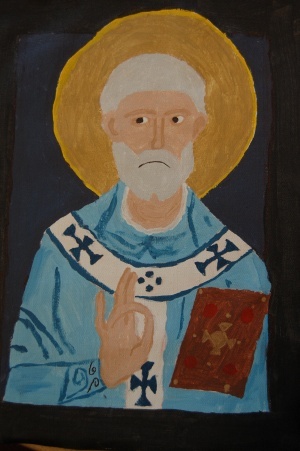 After thoroughly researching and writing about their subject (which introduces them to skills such as library research and citing references), students are asked to get creative with three art assignments: an ancient map, an illuminated manuscript, and a painted iconic rendering of their saint. That’s where the Jordan Schnitzer Museum of Art (JSMA) comes in. The museum’s education and outreach program called ArtsBridge provides stipends to University of Oregon scholars to conduct arts-related workshops and provide professional development to the community. Many of the creative ideas used in the Living Saints curriculum have come directly from these scholars. For instance, one UO scholar taught students how to prepare the paper for their “ancient” map project: apply a special “secret antiquification fluid” (brown tempera paint mixed with water) to tracing paper, allow to dry, crinkle vigorously, then smooth, and, voila, a surface ready for a young cartographer. To prepare for the icon-painting assignment, the students took a field trip to the JSMA’s A. Dean and Lucile I. McKenzie Russian Icon Gallery, which features artwork dating from as far back as the fourteenth century. They also heard a classroom talk about icons by A. Dean McKenzie himself, professor emeritus in the School of Architecture and Allied Arts and an expert on the subject. A local iconographer, Teresa Danovich, volunteers her time to help students learn the sacred art of “writing” an icon. “People speak of ‘writing an icon’ because the sacred icons were intended to tell a story at a time when people often couldn’t read,” Obersinner explains. The paintings are rich with symbolism, so to help people understand the stories of the saints and the scripture, every detail conveys meaning. For instance, Saint Peter holds keys to illustrate the authority given him by Christ; Saint Michael the Archangel carries a spear to signify his position as a warrior. Colors are symbolic, too: black might signify evil, red may denote a martyr, purple robes indicate royalty, and brown clothing represent poverty or a monastic life. Icon artists painted the dark colors first and the lighter colors later to symbolize emerging spirituality. They also honored the spiritual aspect of their work by prayer and fasting. Last spring the Living Saints exhibit—fifty-two sacred icon paintings (acrylic on canvas) created by Mrs. O’s students—hung on the walls of the JSMA. Along with regular museumgoers, about 5,000 school children viewed the icons. Claire Farrington was one of the proud student-artists whose work was on display. “It was so cool because everybody could see it and schools took field trips to see our artwork,” she says. 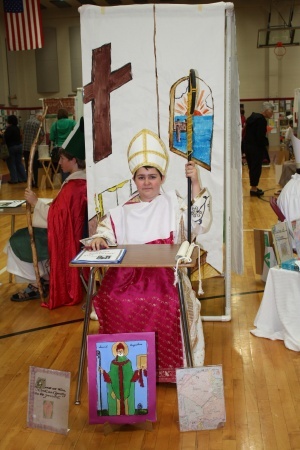 Capping each year’s Living Saints Project is a public presentation at O’Hara School. Students dress as their saint and stay in character while fielding questions from nearly a thousand guests who wend their way through the school’s gym and come face to face with personages such as Saint Ignatius of Loyola, dressed in faux chain mail; Blessed Kateri Tekakwitha, a Mohawk-Algonquian woman in traditional Indian attire; or Saint Edith Stein in full habit. Public speaking can be daunting for a twelve-year-old, but after three months of living and breathing their saints, Obersinner says, not only do her kids know their stuff, they take it very seriously. “One year I had a student that I forgot to call by his saint’s name and he wouldn’t respond to me!” she recalls, laughing. The Living Saints Project garnered the 2008 Catholic Schools for Tomorrow Award for Innovations in Education in the category of Total Community Involvement, presented by Today’s Catholic Teacher magazine. And in 2009, Obersinner won the Distinguished Teacher Award for the Northwest region given by the National Catholic Educators Association.